Abstract: Encapsulated within two seamless sandblasted aluminum halves is one very capable 64MB MP3 player. One of the side effects of reviewing so many consumer products from so many different companies on a regular basis is that you eventually become very sensitized to the little details. Things like packaging and presentation (believe it or not) begin to play a more important role in the overall impressions we reviewers have to construct about the products we test for you. 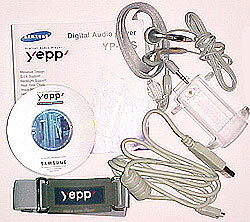 In this case, the Samsung Yepp YP-30S showcased not only the expected MP3 storage technology, but packaging, design and accessory details on the level of what you would expect from Sony. The player and all of its accessories are packaged in a thick-walled transparent plastic cylinder with translucent removable caps at each end. Inside is a heavy weight white plastic cone that delicately holds the player like a museum piece behind armored glass. Inside the white cone are hidden all the cables, headphones and whatnot the player uses, as well as the instruction booklet. At the base is a small die cut piece of foam that securely holds the battery, belt clip, lanyard and 3.5" CD in place. The bottom cap doubles as a CD tray for the software and drivers disc which is included. 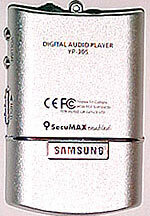 A transparent graphic is applied to the inside of the outer cylinder giving the entire product a presentation that will securely win a packaging award in ID's 2002 Design Review (should Samsung decide to enter it). Now it you're not one to get all excited over such a well throughout and clever packaging concept, you will be blown away by what the Samsung designers have done for the YP-30S itself. Encapsulated within two seamless sandblasted aluminum halves is one very capable 64MB MP3 player. As I've seen Samsung struggle with awkwardly shiny buttons in the past, I was exceptionally pleased to see a low profile Jog-Dial like switch for the play/pause/stop and fast forward/reverse operations on the top of the unit. The indiglo backlit LCD boasts matrix display and of special note, a user customizable opening graphic. The LCD panel sits behind Samsung's evolving standard mirrored Plexiglas shield with machined edges. 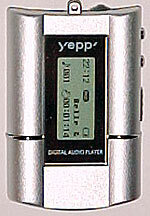 The lower-half of the player drops down to reveal a secret compartment housing the record and menu buttons, (recording comes via a built-in monophonic condenser mic) and the USB unlink jack. By depressing a small catch lever on the opposite side with a pen tip the bottom half of the metal casing comes free to allow a fresh AAA battery to be inserted. Battery times are on the order of about 5 hours. Transferring favorite MP3's to the 64MB of the onboard flash memory is processed by Samsung's mature Yepp Explorer 2.0.1 and USB cable. The software also makes it possible for the user to upgrade the onboard firm ware and by means of some special software from Samsung, customize the look of the startup screen. All this in something no larger than a typical pager, and weighing only 32 grams.